In Loyalists & Revolutionaries: Political Leaders Compared, Mostafa Rejai and Kay Phillips develop and test a two-stage model of leadership.1 According to Rejai and Phillips, individual psychology, acquired skills, and situational or environmental characteristics converge and interact in the making of leaders and, at the same time, channel them into either of two opposing paths at a time of political crisis. One is that of the loyalist, or defender of the status quo; the other is that of the revolutionary, or agent in the violent overthrow of the reigning regime. Drawing from the existing literature and their own previous work, Rejai and Phillips started with a set of hypotheses about leadership and about differences between loyalists and revolutionaries. Most of the hypotheses did not withstand encounter with data obtained from a “a nonrandom purposive sample” of 100 political leaders representing several continents and three centuries (Rejai and Phillips 1988: xxi). Nevertheless, in this paper all their initial hypotheses will be evaluated in light of the evidence available on Franco and Castro. In this section, the original hypotheses are laid out; in the following section the hypotheses are applied to the study of Franco and Castro, with special attention paid to those that survived Rejai and Phillips’ quantitative tests. Although noting that “leadership is a timeless and universal phenomenon, and that all societies at all times have leaders,” Rejai and Phillips never define political leadership explicitly. Instead, they say that “wherever we use ‘leaders,’ ‘leadership’ or ‘political leadership’ we refer only to the two populations of loyalists and revolutionaries we have studied” (Rejai and Phillips 1988: xxi). However, the authors convey an implicit understanding of the term, made manifest in the following sentences: “[L]eaders are in a position to internalize, articulate, and respond to the needs, wishes, desires, and aspirations of their people. Failure to maintain vital ties with the followers will impede or block reaching high office…” “Situations of crises—whether political, military, social, economic, or psychological—catapult the leaders into prominence and provide them with ready and willing groups of followers” (Rejai and Phillips 1988: 9-10). Thus, for the purpose of this paper, where the subject of study are two men who conquered the pinnacle of power at a time of crisis, becoming absolute dictators for life, political leadership is understood to mean the exercise of control over the population of a country, made possible by the acquisition of a following of loyal supporters, be they elite or mass or a combination thereof. Rejai and Phillips do define the two types of leaders they study, those who occupy opposing positions at a time of political crisis brought about by, among other things, such events as “coups d’etat, riots or rebellions, mass violence and civil strife” (Rejai and Phillips 1988: 10). One is the “revolutionary,” “a person who risks his life by playing a prominent, active, and continuing role throughout the revolutionary process.” By revolution is meant “the mass violent overthrow of a political regime in the interest of broad societal change.” The other leadership type is the “loyalist,” “the counterpart of a revolutionary in a key political (elective) or governmental (appointive) position” (Rejai and Phillips 1988: xiv). Juxtaposing the two leaders: “Loyalists extol the established order; revolutionaries denounce it, articulating an alternative vision embodying, in their view, a superior (perhaps even utopian) society” (Rejai and Phillips 1988: 12). Be it noted that the characterization of loyalist or revolutionary is applicable only to the individual’s behavior leading up to “a revolutionary power seizure or a loyalist’s assuming highest office,” not what he does afterward (Rejai and Phillips 1988: xvi). Also, it is possible for a loyalist to turn revolutionary and viceversa. Rejai and Phillips cite the example of Fidel Castro himself: Loyalists-turned-revolutionaries participate in the legal political processes of their societies, find the system unresponsive, and turn to revolutionary politics. In other words, had it not been for the unresponsiveness of the system, these men might have become members of the establishment elite. To use a single illustration, Castro was an active candidate in the Cuban parliamentary elections of 1952, when Batista’s coup suspended the constitution and halted the electoral process, catapulting Castro toward a revolutionary course (Rejai and Phillips 1988: xix). Three constellations of factors are hypothesized to converge in the making of a political leader. One is situational, operating at either or both the social and individual level. The political crisis that creates opportunities for leadership operates at the national or historical level. At the individual or family level are found “personal traits or characteristics that are ‘external’ to political leaders and over which they have, as individuals, no control. These include: birthplace, number of siblings, age ranking among siblings, ethnicity, and religious background” (Rejai and Phillips 1988: 10). 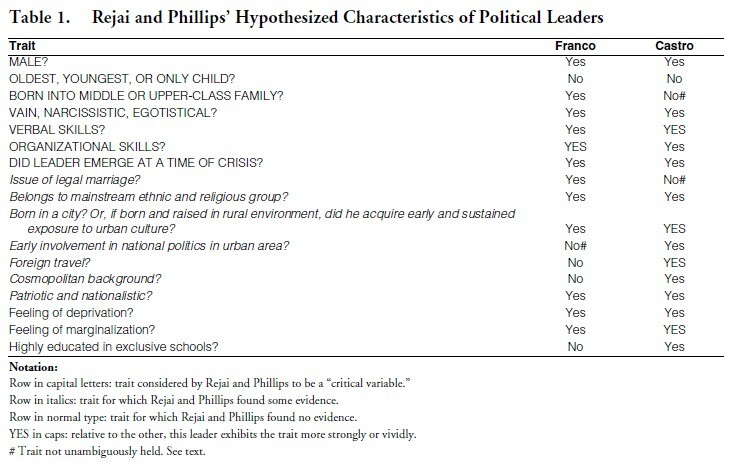 Rejai and Phillips hypothesize that political leaders who emerge at a moment of national crisis are disproportionately to be found among men exhibiting the following characteristics: a first, only, or youngest son, born into a middle- or upper-class family belonging to the society’s mainstream ethnic and religious group, who experienced city life from an early age. Rejai and Phillips expected two other sets of factors to go into the making of a leader. One, applicable to both types, involves the individual’s “mental set or psychology that propels him toward political action.” Although they did not anticipate an “invariant mix of psychological dynamics [to be] universally applicable,” Rejai and Phillips proposed a number of motivations. These included characteristics deep within the individual’s psyche, such as vanity, egotism, and narcissism: “A degree of vanity appears to be an indispensable condition of rising to leadership roles.” An oedipus complex, or father-son conflict, was expected to play a part, too. So was a feeling of deprivation, of “discrepancy between aspiration and achievement,” and an awareness of “status inconsistency,” or of marginalization. These internal conflicts were supposed to be particularly acute in the case of revolutionaries, driving them to displace their personal dramas onto the larger political stage. Less self-centered motivations include nationalism and patriotism, which were expected to characterize both types of leaders. Additionally, revolutionaries were assumed to be motivated by a sense of justice to “right the wrongs” of their societies, while loyalists to be driven more by an interest in “‘national development’ or ‘modernization’” (Rejai and Phillips 1988: 11-12). The final set of factors going into the making of a political leader was hypothesized to be “a set of skills— particularly verbal and organizational—that enables him to perform his tasks.” Both loyalists and revolutionaries have to communicate a compelling vision to their followers, to the larger society, and even to foreign audiences. Also, they have “to fashion organizations of various kinds—political, military, and paramilitary. Loyalists, needless to say, by definition control the organizations of their societies. Revolutionaries, on the other hand, must build organizations from the ground up.” “Without organization, there can be no leadership, whether of a loyalist or revolutionary nature” (Rejai and Phillips 1988: 12). Rejai and Phillips found that statistical analysis of their “sample” of loyalists and revolutionaries yielded more socio-economic similarities than differences. Typically, a political leader, whether loyalist or revolutionary, was the only, first, or last son of a legally married couple belonging to the mainstream ethnic and religious group of the country. He was born in a city or gained urban exposure early in life, had a “tranquil, peaceful” family life, was exposed to politics no later than in his teens, was “highly educated, frequently at exclusive schools,” traveled widely, was a published author, and had a “dualistic” attitude toward the international community, “distinguishing friends and foes” (Rejai and Phillips 1988: 18). In short, we have, on the one hand, a group of men that begins very early to set the stage, stage, to prepare the way, and construct the building blocks of the political roles they come to play in later life: they are loyalist leaders who are, by and large, career oriented. On the other hand, we have a group that bursts upon the scene to claim political roles for which they have no particular preparation: they are revolutionary leaders who are propelled, by and large, by crisis situations. Returning to our idea of differential access, loyalist or career leaders grow to adulthood and maturity in close proximity to sources of power and prestige in societies. Lacking such proximity, revolutionary or crisis leaders spend their lives in pursuit of access to influence and authority, seizing upon such opportunities as may come their way (Rejai and Phillips 1988: 36). Two other sets of differences discriminated between loyalists and revolutionaries, all having to do with the leader himself. One had to do with attitudes, the other with his occupation and age at which he reached the highest office. “A significant number of loyalists are likely to have careers in government service while not a single revolutionary had such an occupation as his primary line of activity. Loyalists tend to be older when assuming highest office; revolutionaries are younger at the time of power seizure” (Rejai and Phillips 1988: 40). Regarding attitudes, loyalists usually remained steadfast in their religious beliefs while revolutionaries frequently abandoned them, becoming atheists; loyalists were usually pessimistic about human nature but optimistic about their country, whereas revolutionaries were more sanguine about human nature but their feelings about their country were contingent “on the regime in power” (Rejai and Phillips 1988: 40). [I]f a leader remains steadfast in religious beliefs, if his father is a government official or in such other occupations as the military, banking and industry, the professions, or landed gentry; if the leader himself is in government service; if he holds a pessimistic view of human nature but a uniformly optimistic view of his own country—under this set of circumstances, the leader is likely to become a loyalist rather than a revolutionary. By contrast, if a leader abandons his religion to become an atheist, if his father has an occupation not included above, if the leader is not in government service, if he has an optimistic view of human nature but a fluctuating attitude toward his own country depending on the regime in power— under this set of circumstances the leader is likely to become a revolutionary rather than a loyalist. (Father’s occupation as government official and religious orientation, it will be recalled, have the greatest predictive value.) Once again, in other words, access to political power becomes the cutting edge separating the loyalists from the revolutionaries (Rejai and Phillips 1988: 109-110). FRANCO AND CASTRO: LOYALIST VS. REVOLUTIONARY? Tables 1-3 present evidence on Francisco Franco and Fidel Castro on all the traits that Rejai and Phillips considered, whether or not they passed their empirical tests or turned up as “critical” variables in predicting leadership or leadership type. Starting with the first table, which collects leadership traits considered by Rejai and Phillips, be it noted that both dictators unambiguously exhibit most of the seven “critical” characteristics of a leader, 86 percent in Franco’s case and 71 percent in Castro’s. The one exception they share is birth order, as neither was the only or first or last son. The other miss in Castro’s case has to do with his class background, which is ambiguous. His father, Angel Castro, was a Spanish immigrant from Galicia (Franco’s own region). A former laborer, he was rich but uncouth. Lina, his mother, was once a maid in Angel’s household. Castro himself was born out of wedlock, the issue of an illicit union between Angel and Lina. After his first wife died Castro’s father married the mother. Lacking social respectability, the Castro’s were hardly middle-, let alone upper-class. Thus, Castro came from a nouveau riche family not easily classified. Recall that awareness of “status inconsistency” or “marginalization” is one of the variables initially considered by Rejai and Phillips as providing a motivation to make a bid for political leadership, although the evidence on the 100 leaders they studied did not support their expectation. However, in Castro’s case this characteristic may have played a part in his political ambition not only to make himself a leader but to revolutionize Cuban society “from one end to the other,” as he wrote from prison he “would sincerely love” to do (Quirk 1993: 66). Regarding other traits, both Franco and Castro belong to the country’s mainstream ethnic group and (in the case of Castro, at least initially) the mainstream religion; both acquired exposure to city life early on, and both were patriotic and nationalistic. Additionally, in contrast to Franco (who before seizing power had been out of Spain only once, on a brief visit to Germany for professional reasons), Castro traveled and resided abroad as a young man (Colombia, the United States, Mexico), was educated in exclusive schools, and had early involvement in national politics in Havana, the country’s capital. All in all, out of a total of 17 leadership traits considered in Table 1, Franco unambiguously exhibits 12 (71 percent) and Castro 14 (82 percent). The fact is that Castro embarked on a revolutionary path long before Batista’s 1952 coup against the constitutional government, which derailed Castro’s hope of winning a legislative seat. He plunged into quasirevolutionary politics at the University of Havana, where he packed a pistol and twice was suspected of murdering members of a rival political gang. In 1947, at age 20, he joined the aborted Cayo Confites expedition to overthrow the dictatorship of Rafael Trujillo in the neighboring Dominican Republic. The following year found him in Bogotá, Colombia, where he participated in an attack on a police station during the days of frenzied violence known as the Bogotazo. When the leader of the opposition Ortodoxo Party to which Castro belonged, Eduardo Chibás, died of a self-inflicted wound, Castro tried to convince José Pardo Llada, a leading Ortodoxo who was in charge of the funeral, to exploit the outpouring of popular grief in order to seize power by diverting the procession from the cemetery to the presidential palace, taking over the building, and overthrowing the elected president.3 In short, Castro fits the profile of the revolutionary almost perfectly, as is evident in Table 3. One suspects, then, that he was meant for a revolutionary life from the beginning. It was not Batista’s 1952 coup which turned Castro from a loyalist into a revolutionary, as Rejai and Phillips allege. He was a revolutionary all along, for whom Batista’s coup opened an enviable opportunity to employ violence as a means to conquer political power. By contrast, Franco’s profile is that of a loyalist, although less so than Castro’s is that of a revolutionary. Franco unambiguously fits five of the seven “critical” loyalist variables, but only another four of the remaining seven for which Rejai and Phillips found some evidence. The two “critical” loyalist variables missing in Franco’s profile are arguably the most important of all, father’s occupation and early politicization at home, since they define what Rejai and Philips call proximity to power. Recall that father’s occupation was one of the two (the other being religion) most important variables in predicting leadership type. Loyalists tend to be born into a family of the establishment by virtue of some combination of political power, wealth, professional prestige, and social connections. Franco was born into a family that for generations had served in the Navy. The father was employed in government, but he was not powerful or influential. Moreover, he was a gambler and a womanizer who deserted the family when Franco was 15 years of age. Thus, he was of no help to Franco’s career. In fact, Franco had wanted to follow the family’s tradition of service in the Navy, even nurturing the hope of being admitted to the prestigious naval cadet ship. But admission restrictions closed this avenue to him. Presumably, his family lacked the pull to get him in, so he joined the infantry school in Toledo, instead. Thus, Franco did not grow up in close proximity to power. It was his exploits as a military officer in Spanish Morocco, where he distinguished himself for valor combating the insurgents, that through successive combat promotions made him the youngest general in Europe. Unlike the typical loyalist, then, Franco did not have power served to him on a silver platter. Rather, like a revolutionary, he spent decades in pursuit of it. Like Castro, Franco was a self-made ruler. 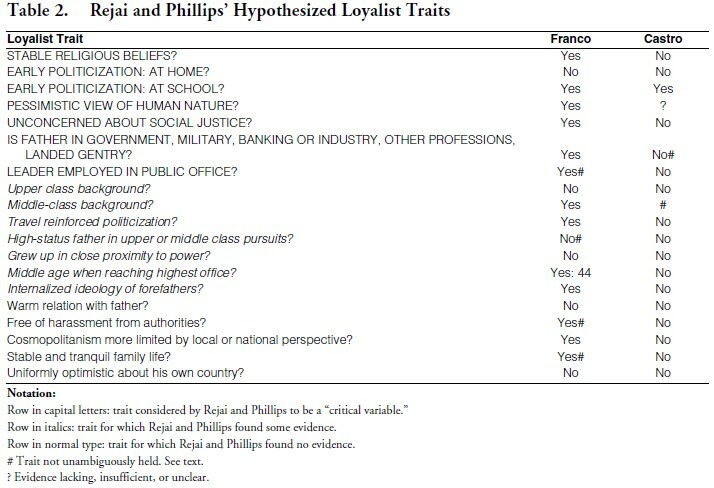 Table 3 displays Rejai and Philips’ hypothesized revolutionary traits. Only one, access to power, is a critical variable. Neither man was born inside or even close to the circles of economic or political power or social prestige. As for the other traits, note that Castro unambiguously exhibits all but two of them, father’s occupation and class background, which have already been discussed. As for Franco, he fits 5 out of 12, or almost half. These include the Oedipus complex, an eclectic ideology that combines indigenous and domestic elements, a view of the country that is contingent on the regime, and, most importantly, lack of access to power early in life and the concomitant pursuit of it as an adult. His relation to his father has already been discussed. Franco’s ideology evolved into a veritable olla podrida (stew of several meats, starches, and vegetables) of ideas: elements of Catholicism, Spanish traditionalism, corporatism, fascism, anti-communism, and anti-liberalism, with anti-English, anti-American, and anti-Masonic prejudices thrown into the mix. At times Franco said things that sounded like Fidel Castro, as in the following comment to one his intimates, made as late as 1967, after three decades in power and only eight years before his death: “I believe that all the activities which have been carried out in the western world against us have been carried out by organizations which receive funds from the CIA above all with the intention of establishing . . . an American-style political system on the day that I cease to be around” (Preston 1994: 733). Ironically, Franco, who had most of the marks of the loyalist, who for the first two decades of adult life had faithfully served the existing order, paying homage to country and king, and who had even played a key role in 1934, under a conservative government, in repressing an insurrection against the Second Republic on the part of anarcho-communists and regionalists, was reluctantly drawn into a military conspiracy to overthrow the government after the Popular Front won the 1936 election. Franco abhorred the socialists’ anti-monarchist, anti-military, and anti-clerical sentiments and policies, and felt that during their first administration, in 1931-1933, they had treated him shabbily, in a manner that was not in keeping with his merits. Once he crossed the Rubicon to join the rebels in 1936, Franco cunningly maneuvered himself into a central position on the Nationalist side, using his contacts with Nazi Germany and fascist Italy to elbow the original organizers of the uprising out of the way. The fortuitous death of several of his rivals clinched his conquest of power even before the Nationalists emerged victorious in the Spanish Civil War. Upon defeating the Republicans, Franco did not immediately recall and restore to the throne the exiled King Alfonso XIII. On the contrary, he treated the exiled monarch coldly, even insinuating that the Spanish crisis had been his own fault.4 Once triumphant, Franco embarked on a project to remake Spain according to some hybrid blueprint of ancient and modern models, a mixture of Catholic Medievalism and Italian fascism whose underlying ideology was anti-liberal and anti-bourgeois. What we have in Francisco Franco and Fidel Castro, then, are two men who fit the political leadership profile about equally well. Furthermore, both are self-made rulers who, starting out far from the political center socially, economically, and geographically, forced their way into the palace of power. Both acquired absolute mastery over their countries by violent means at a moment of political crisis. Once in charge both Franco and Castro set about remaking their countries according to an anti-liberal vision, one of the “right,” the other of the “left.” Castro’s revolutionary project within and without Cuba needs no elaboration. What needs pointing out, though, is that Franco was, in his own way, something of a revolutionary himself, even if his “revolution” looked both backward, toward Spain’s heroic age, as well as what in the 1930s and 1940s appeared to him to be forward, toward fascism. Franco did not return Spain to the status quo ante, as a loyalist would supposedly have done. Instead, he attempted to reverse something like a half-a-century of intermittent Spanish evolution in the direction of Western-style parliamentarism while looking to Mussolini’s Italy and Hitler’s Germany’s for state-directed economic models. This was, in effect, a reactionary/revolutionary project. However, unlike Castro, who fits the revolutionary profile perfectly, Franco had most of the characteristics of the loyalist. He was not born a bona fide member of the establishment, but from an early age he, like his ancestors, became its faithful servant. Had Spain’s Second Republic not come into being, or even if only the conservatives had controlled the government or the socialists pursued a moderate course, in all likelihood Franco would have reached normal retirement age after an illustrious military career capped by a term as High Commissioner for Morocco, the post he had aspired to as a young Army officer. By contrast, Castro’s profile is that of a man who was meant for revolution from the beginning. Had Batista not overthrown Cuba’s constitutional government, it is all too probable that Castro would either have attempted the job himself, as he tried to get Pardo Llada to do at the time of Chibás’ funeral procession. Or perhaps, like Ernesto (Ché) Guevara, he might have joined a revolutionary organization elsewhere in Latin America, e.g., in Colombia, the Dominican Republic, Nicaragua, or Venezuela. Thus, with Rejai and Phillips, I conclude that in both cases the situation was critical in the making of these two dictators. However, circumstances played contrasting roles in the political fortunes of Franco and Castro. Spain’s political crisis displaced Franco from the normal course of his career, turning him from a loyalist into something of a “revolutionary.” In the case of Castro, however, Cuba’s crisis simply enabled him to fulfill the role that he was meant to play from the beginning, that of the consummate revolutionary, a wrecker of regimes and countries. 1. Many thanks to Professors Rejai and Philips and to Carlos Alberto Montaner for their kind words and encouragement on an earlier draft. 2. I have found no systematic, comprehensive comparisons of Francisco Franco and Fidel Castro, although Montaner (2002) draws several important parallels between the two caudillos in an essay on the politics of 20th century Cuba and Spain. Anyone who knows of other studies matching the two rulers is hereby asked to call it to the author’s attention at acuzan@uwf.edu. 3. The foregoing account tracks closely passages from my previous essay on Castro (Cuzán 1999: 27-28). On Castro’s suggestion to Pardo Llada, see the latter’s book (1989: 70-73).